Lindau is one of the most beautiful places at Lake Constance. This city belongs to Bavaria and is located on the North-Eastern side of the lake. The medieval City Centre is located on a small island in Lake Constance which is connected to the mainland through a bridge. Lindaus existence was first mentioned 882, in a document of a monk from nearby St. Gallen. Later first churches and a monastery was founded and 1274/75 Lindau became an Imperial Free City in the Holy Roman Empire. In 1804 it became part of the Austrian Empire (for one year) and since then it belongs to Bavaria. Lindaus great location and its rich history make it a perfect place to visit. In summer you can reach it by boat service, as there are several regular boat lines that connect all the cities at Lake Constance. This is one of the first great places to take pictures, too. 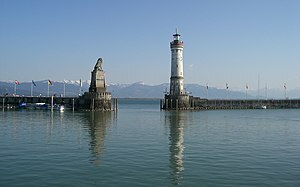 The entrance to the harbour is guarded by a light tower on one side and a statue of the Bavarian Lion on the other. There are nice restaurants and you can enjoy the view from Lindau over the lake towards Bregenz (Austria). But you should enter the medieval centre of the city, too, as there are lots of beautiful houses to be seen. Especially nice is the Maximillian-Strasse in the centre, it features colonnades and you will be amazed by the many details that can be found. The old city hall is also very impressive, its front side features a painting which tells the history of Lindau. There are still parts of the old city wall existing and the remaining towers will provide a great background for commemorative pictures.